Today was a “museum day,” something I have not done quite this way before. We began at Yad VaShem, the Holocaust museum in Jerusalem. This is one of the best designed museums I have ever visited. A person can walk through the story of the Shoah from the beginnings of anti-Semitism and the rise of Hitler through the horrific events in the ghettos and death camps. There are numerous video interviews with survivors who tell their stories, many of these devastate me even though I have heard them several times. If you have the time to read the hundreds of displays you will have a full education in world history surrounding the Holocaust. While there are a few this that betray a bit of a slant, overall I think this is a museum all people should experience. I am always interested in the reactions of my students as they encounter the story in more detail than an American usually hears. I think this group is one of the more serious I have had the pleasure of leading, and they asked several excellent questions along the way. I was surprised, however, that several did not really realize the Christian community not only was silent when the worst was happening, but participated in the crimes of the Holocaust. One asked me when the Nazis started coming after Christians. My response (“these were the Christians!”) shocked the student. For those who are a bit younger, it is impossible to imagine the kind of police state that could enforce the crimes against humanity described in detail in the Yad VaShem. 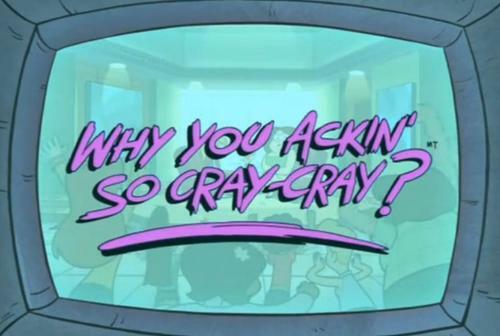 To me, this is the question the present generation must deal with. The events of the last week in Baltimore indicate a peaceful nation can be torn apart suddenly. The Christian church cannot be silent about racism against any people nor should we actively participate in attacks against people based on irrational prejudice. For the first time in many years I took a group to the Israel Museum. After walking around Jerusalem yesterday, most on the students were very interested in the model of Jerusalem from the Second Temple Period. While there a few odd things in the model I don’t quite understand, it is a wonderful teaching tool and most of the students actively participated in our discussion at the model. We walked over to the main museum and I let the kids have something to eat and the walk through the archaeological wing at their own pace. I naturally skipped lunch to spend maximum time looking over the excellent collection. I would estimate an interested visitor could spend several hours in this section alone! There are too many highlights to list here, but I thought the early history of Canaan was particularly good, and there were several important inscriptions on display from the later Second Temple period. There might be a rumor going around I “giggled like a school girl” on one occasion, but that remains unconfirmed. We start early tomorrow at the Mount of Olives. It will be a long walking day, but very exciting. Today was a very long walk from our hotel to the Old City of Jerusalem. According to several step-counters people wore, we walked about 7 miles today. One estimate was higher, but the other two were a bit lower, but based on how my feet feel, 7 miles is just about right. We started walking for our hotel Garden Tomb, a short walk from our hotel. As always the Garden Tomb is a delight. The grounds are a well-kept garden and the staff guides have always been very good. What I particularly appreciate is the clear message that it does not matter if this was the real tomb of Jesus, the only this that is important is that he is not in the tomb! In fact, there is almost no chance this was the tomb of Jesus, but the Garden Tomb is a lovely place to think about the death and resurrection. We had a short communion service (accompanied by the loudest sparrow in all Israel). From the Garden Tomb we walked up the hill to Jaffa Gate. I will admit the hill is a bit steeper than I remember. We (ok, I) stopped about halfway up the hill to catch our breath, and while I was standing there young man approached me and asked if I was leading a tour. I thought this was perhaps a tour guide trying to find a job, but it ended up being a gentleman from Serbia who is visiting Jerusalem for one day and hope to be able to join us as we visited a few sites. He ended up being a great addition to the group and we had a nice talk over lunch about history and politics. 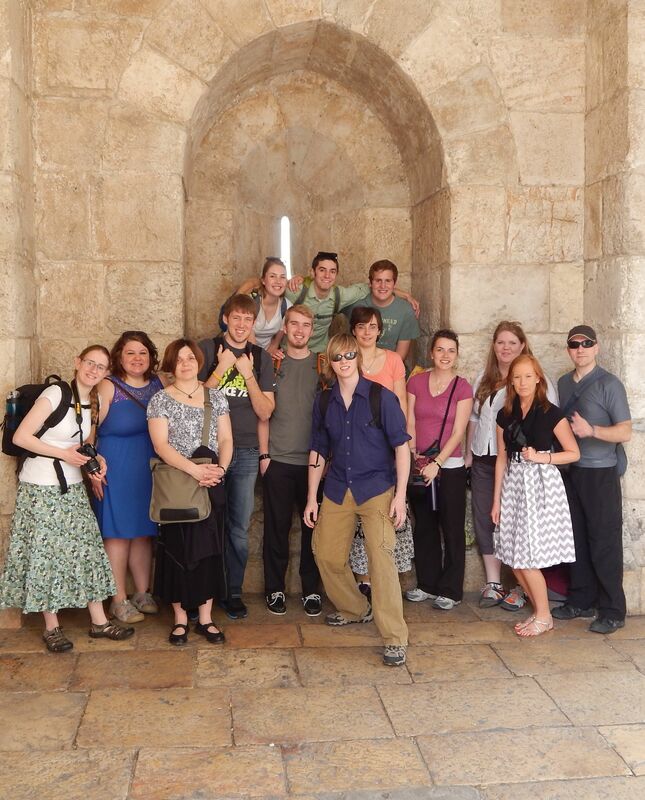 We did the Rampart walk from the Jaffa Gate to the Damascus Gate. This walk gives the students an overview of two or three sections of the city. The highlight for me is the Hadrian-era Damascus Gate, since this shows how deep underneath the present “old city” the first and second century city of Jerusalem really is. Unfortunately the gate is not accessible as it once was. I used to be able to walk under the existing Damascus Gate and go through the the gate back up to the Ramparts. All this is locked out now. From the Damascus Gate we headed back to visit the Western Wall. I had intended to visit the Pool of Bethesda, but we did not get off the Ramparts until noon, the site was closed. We did stop for lunch (your choice, pizza, schwarma or falafel) and an icy lemon mint drink. The Western Wall plaza has not changed much since the last tour, although I noticed they moved the entrance to the Temple Tunnels back by the security checkpoint. The Herodian excavations are not open to the public, and the people at the gate resisted my plea for a quick look. I this this is going to be a very nice addition to a Jerusalem tour in the future. I took the group up the steps toward the Jewish Quarter so the could buy some cold water or maybe an ice cream. Unfortunately the toilets were under repair, so several of us (mostly Zac) were in great need. After most of the group bought t-shirts of American sports teams in Hebrew, we cut back through the city to the Holy Sepulchre. The Holy Sepulchre is one of those places your need to visit on a tour to Israel,although I am never really happy about it. It is of great historical significance, but it is also a place where many legends about Jesus are perpetuated to serve the faithful. 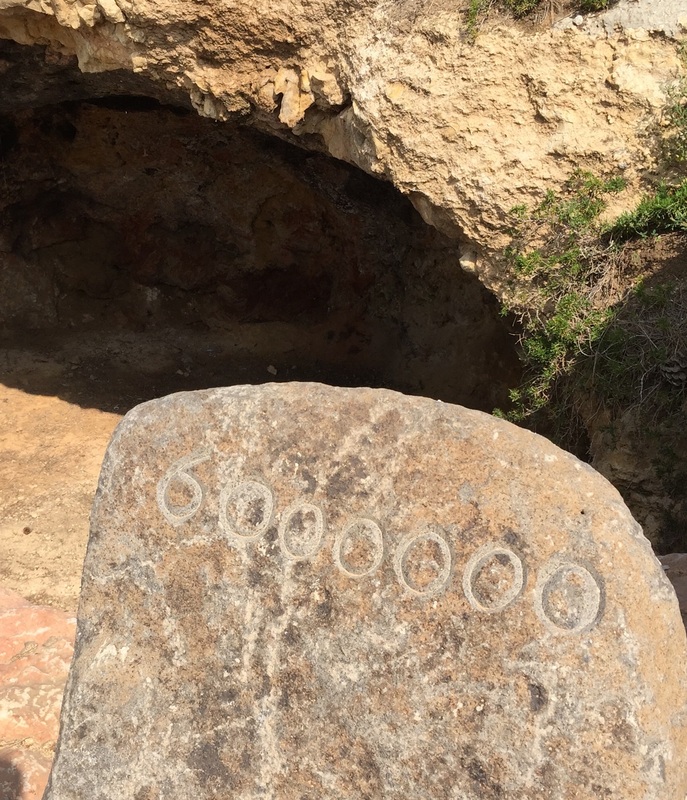 Is the is real site of Golgotha and the Tomb? Perhaps, and there is a better chance this is the site than the Garden Tomb, but as a Protestant, I think the place obscures the truth more than is expected. Back to the Leonardo Hotel for a great dinner, although not everyone appreciates beef tongue like I do. 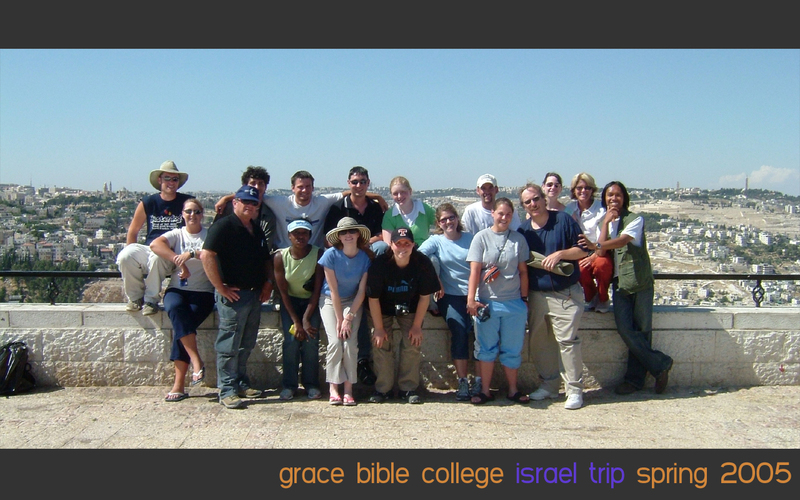 There are 25 in our group, five veterans of previous GBC trips to Israel. 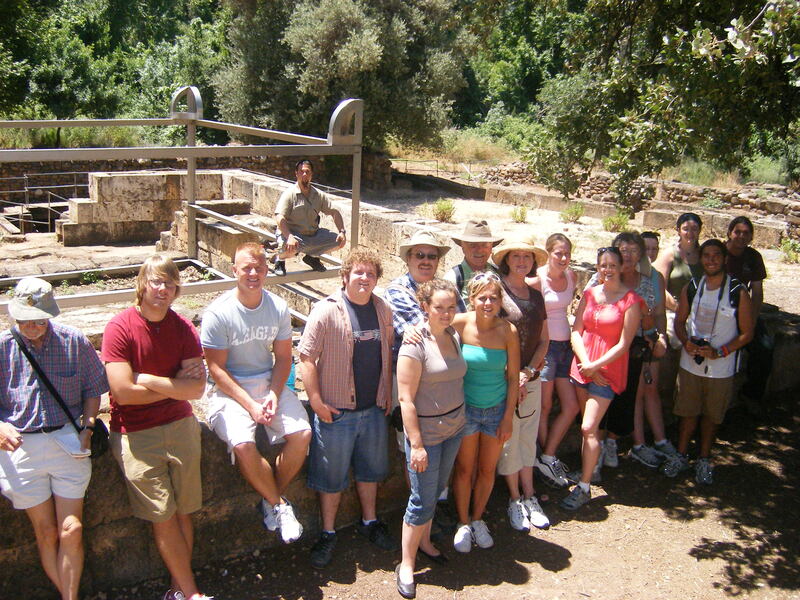 Josh and Lisa Tweist were on the 2011 trip (which started in Jordan) and Becca Zuber was a member of the 2013 trip. She is along as a chaperone. Scott Shaw (professor at GBC) is along for the third time, providing his usual help and occasional Tae Kwon Do lessons. It was good to see Jeremy Herr, a pastor in Long Island and one my my former students. Jeremy flew separate from us and we met up at the Ben Gurion airport. The Chicago to Frankfurt flight was long, eight hours flight time. Not much to do but sleep, although the small child sitting behind me kept that from happening. We had a short layover in Frankfurt before flying to Tel Aviv. Our drive to the Hotel Leonardo near the Damascus Gate was uneventful and we checked in with no problems. 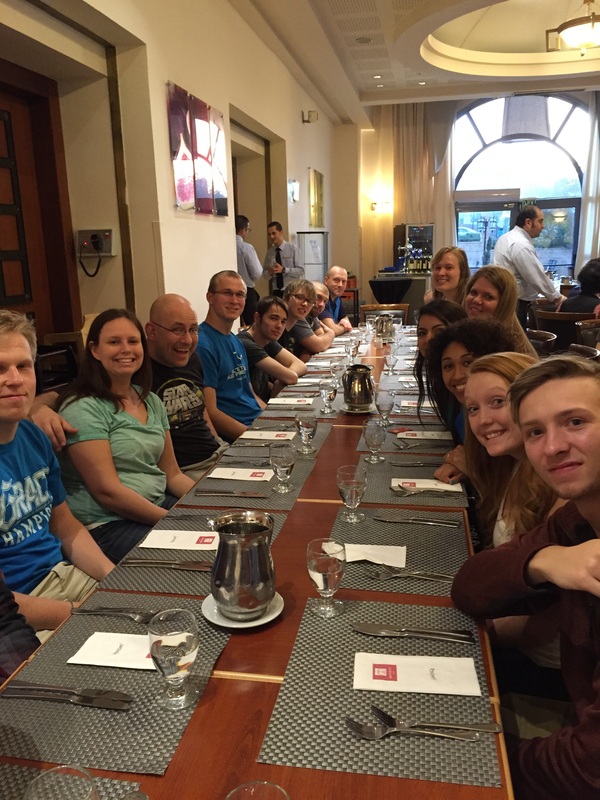 We had a great dinner, no complaints on the food from this group. We start tomorrow at the Garden Tomb, just a short walk from the hotel. 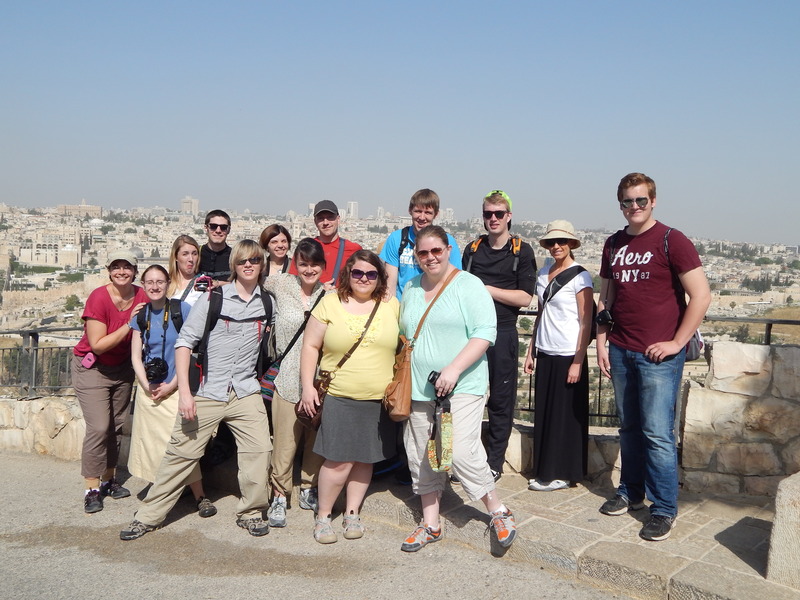 We will the head to the Jaffa Gate and walk the ramparts, visit the Western Wall and the Holy Sepluchure. I am leaving today to lead a tour in Israel and Jordan. This is my seventh trip to Israel since 2005 and I am looking forward to this one a great deal. I have 24 students along with me on this trip and they are all ready for an adventure. We arrive in Tel Aviv and begin with a walk through the Old City, the Rampart Walk, Western Wall and Davidson Archaeological Park. We have a couple of days in Galilee, visiting all the “Jesus sites” as well as Tel Dan. We will cross into Jordan at Tiberius, see Jerash and Mount Nebo on the way to Petra. Finally, after crossing back into Israel at Eilat, we get a few days in the Negev, visiting Arad, Masada, En Gedi, Qumran and a few other sites. I am particularly looking forward to the Southern Temple and City of David excavations, there are always and exciting things to be seen there. I plan on walking down the Mount of Olives and across the Kidron Valley, then up the other side to the City of David excavations. While it is a long walking say, I think it will be an education on just how far people walked in and around Jerusalem in the first century. 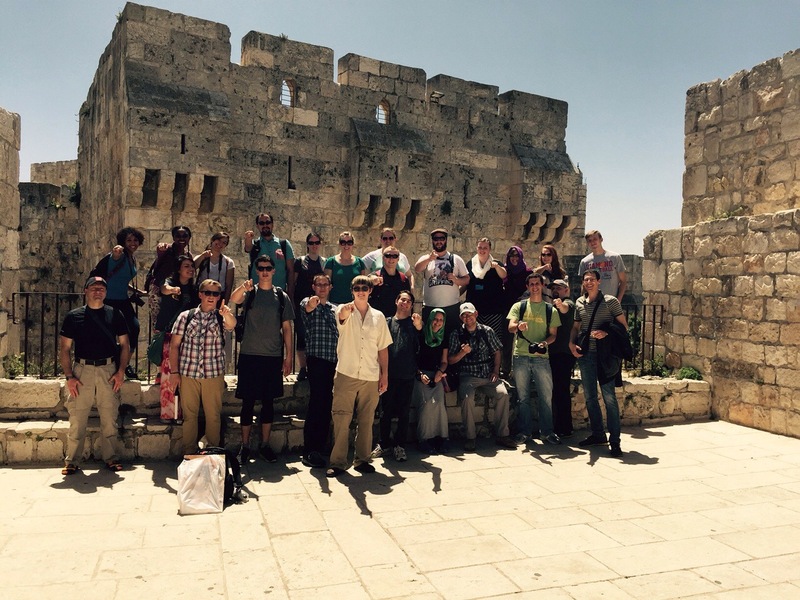 Here is the basic itinerary, days 1-2 are travel and arriving in Jerusalem. Day 3: (Wednesday-April 29) Jerusalem. Jaffa Gate and Old City of Jerusalem. We will pass the Citadel of David and begin the “Rampart Walk.” We continue to walk through the Old City market to the Western Wall, including parts of the Via Dolorosa and visit the Church of the Holy Sepulcher. Day 4: (Thursday April 30) Jerusalem. We will spend the morning at the Yad VaShem Museum and Israel Museum (Dead Sea Scrolls, Jerusalem Model, and the Archaeology wing of the Museum). Day 5: (Friday-May 1) Jerusalem. The day begins on the Mount of Olives, looking across the Kidron Valley. Walking down the Mount we will visit Domiunis Flevit (where Jesus wept over Jerusalem), the Garden of Gethsemane and the Church of All Nations. We will walk across the Kidron Valley past Absalom’s tomb and up to the City of David and Hezekiah’s tunnel and the pool of Siloam. Finally we visit the Davidson Archaeology Park on the Southern wall of the Temple. 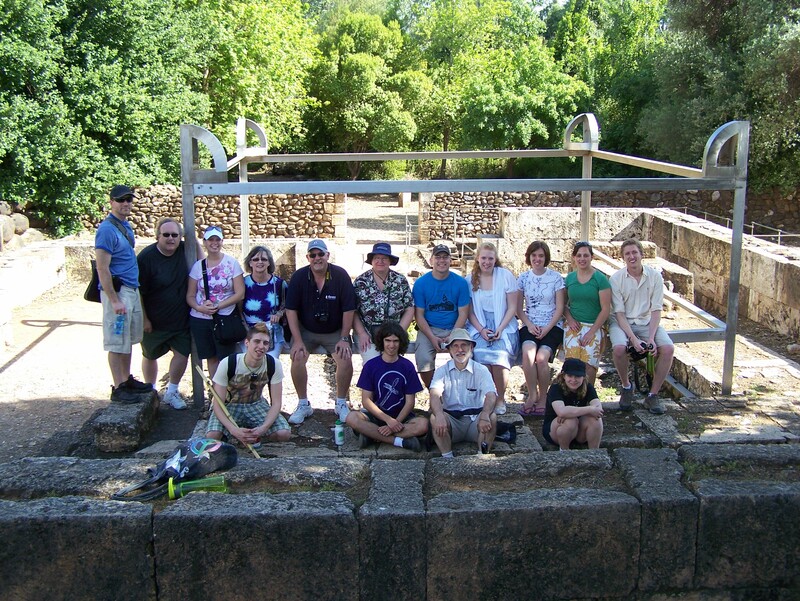 Day 6: (Saturday-May 2) Galilee. We will begin the day by driving from Jerusalem to Caesarea, through Nazareth to Beit Shean, and finally arrive at Maagan Holiday Village in the late afternoon. Day 7: (Sunday-May 3) Galilee. We will begin this day by visiting Mount Arbel, the Mount of Beatitudes, Capernaum, Caesarea Philippi and/or Tel Dan, Kursi. Day 8: (Monday- May 4) Jordan, Jeresh, Mt. Nebo, Amman. We will leave the Galilee early and prepare to cross into Jordan at the King Hussein Bridge and transfer busses in Jordan. We will stop at Jeresh for a tour of this spectacular Roman city. Day 9: (Tuesday-May 5) Petra. We start out for Petra early, walking the Suq to the famous Al Khazneh or Treasury at Petra. We will ahve a full day to explore this fantastic site! Day 10: (Wednesday-May 6) Aqaba, Eilot, Tamar. We will head south to the Red Sea, crossing the border back into Israel at Eilat. After some time swimming in the Red Sea we will arrive at Biblical Tamar Park. Day 11: (Thursday-May 7) Mamshit Tel Arad, Masada, the Dead Sea, Tamar. We will be on the bus early to explore several sites in the desert. Our first stop will be Mamshit, a Nabatean trading village which has been beautifully restored by the Israeli Park service. Then we will visit Arad, an ancient Canaanite city captured by Joshua. We will visit the Israelite citadel and travel to Masada, the famed fortress built by King Herod 2,000 years ago. 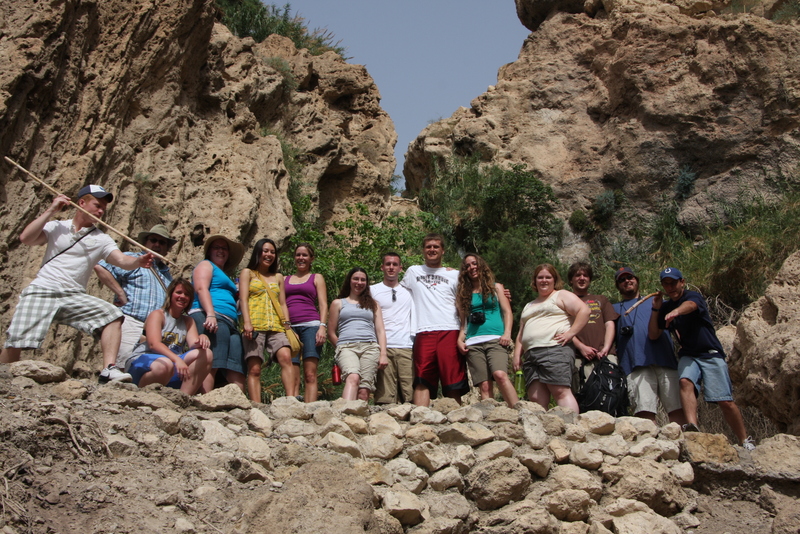 Day 12: (Friday-May 8) Ein Gedi, Qumran, The Dead Sea. We will hike to the waterfall in Ein Gedi where David hid from King Saul, then visit Qumran, the location where the Dead Sea Scrolls were found. We end this day with a float in the Dead Sea. Day 13: (Saturday-May 9). We will depart Tamar Park and visit a few sites on the way to Jerusalem to spend our last few hours in the Old City for shopping. One of the highlights of my tours is spending a few days at Tamar, an archaeological site south of the Dead Sea. The site is small but unique, with remains from the Iron Age (include a small Solomonic Gate and a four-room house), an Edomite shrine, a Roman bath and store rooms, a Turkish water system, a building once used as a jail during the British mandate, and an Israeli bomb shelter. 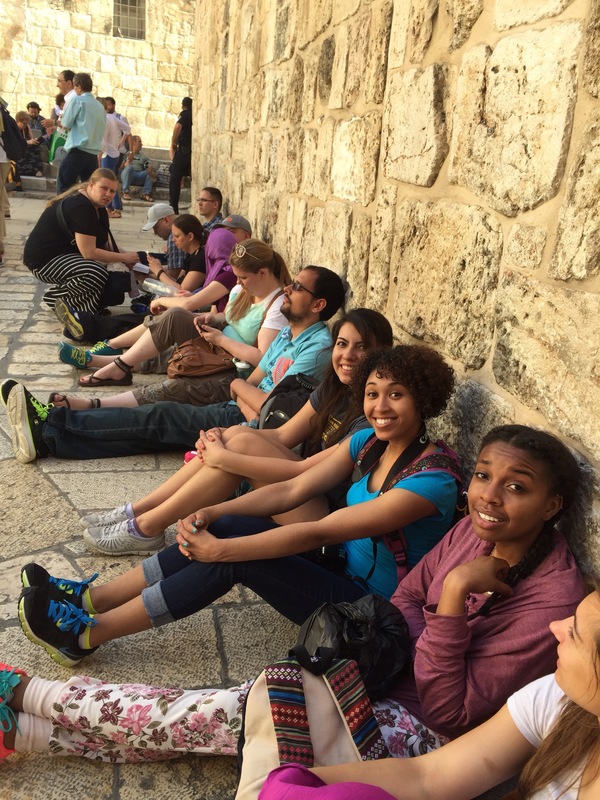 Look for frequent updates from Israel and Jordan over the next two weeks! Last Sunday I had the privilege of preaching for the morning Worship Service at Rush Creek Bible Church in Byron Center, Michigan. I do not get to do this very often since I usually teach the Sunday Evening Bible study as well as a Sunday School class. I was asked to finish out a long series on the Gospel of John so I used the final words of the book as a way to summarize many of the themes of John’s gospel. If you would like to watch video the sermon here is a link: The World Itself Could Not Contain the Books… (Scroll down past the overly large series title for audio or video.) Be warned: people tell me I have a face made for radio. You may prefer to listen to the audio instead! Here is a summary: After the resurrection Jesus met some of his disciples by the Sea of Galilee. 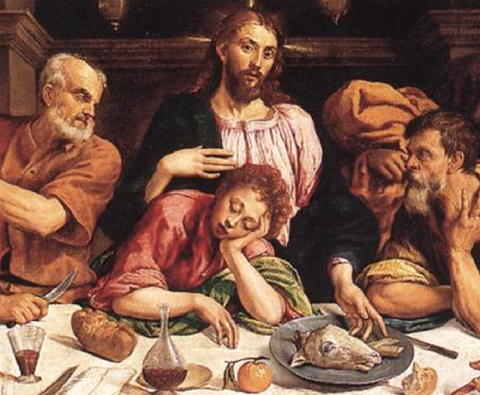 After providing a miraculous catch of fish, Jesus asks Peter three times if he loved him. This conversation was a public restoration of Peter, a confirmation that Jesus has forgiven him and that Peter’s denial will not define the rest of his life. Jesus then predicted that Peter would be faithful to the end; he would be crucified because of his testimony for Jesus. But what about the Beloved Disciple? The final chapters of the Gospel of John have contrasted Peter’s actions with the belief of this disciple, who is likely John, the son of Zebedee. If Peter is to be executed, what will happen to John? John does not want to focus the attention on himself or his book (“I could write more,”or “This book could be much longer….”) The story has been about who Jesus is from the very beginning! “The greatness of the revelation of God in the Logos-Son is vaster than the cosmos created through him.” John’s gospel is about the vastness of Jesus from the first line to the last. It is remarkable that the final words of Jesus are “you follow me!” Jesus began his ministry asking people what they wanted of him. In John 1:38, Jesus’ first words are “what do you want?” and he command his disciples to follow even then (1:43). At the end of the book Jesus expects his two closest disciples to continue to follow him, one to his death, the other to a long life of ministry, both looking forward to the return of Jesus in glory. If Luke has carefully designed his two-volume history, we should probably pause to wonder why he includes such lengthy description of the journey to Rome. This must be more than an exciting story (did he think readers were getting bored? ), nor was Luke trying to fill out a scroll (as if he was a student trying to make it to 10 pages for a paper). There are literary and theological reasons for Luke’s inclusion of Paul’s shipwreck. First, Luke is traveling with Paul. On the one hand, this accounts for the details. But often ancient historians narrate a story up to the time in which they are living and then include themselves in the story in order to build credibility. Josephus summarized all of Jewish history up to the time of the Jewish revolt and included himself in the story as a leader in Galilee. Thucydidies wrote a history of the Peloponesian War and included his own participation at various points. This shipwreck functions to give Luke credibility – he witnessed the events himself and was a participant in the history he tells. A Greco-Roman reader would expect this sort of thing if the book of Acts was to be seen as credible. Second, there is more going on here than Luke’s interest in travel. If someone (say, Theophilus) has been reading through Luke and Acts, he would notice some similarities between Paul and Jesus. Both are arrested by the Jews and handed over to the Romans, both are tried by a secular authority (Pilate and Herod; Felix/Festus and Agrippa) and both are the victims of a miscarriage of justice motivated by the religious establishment in Jerusalem. Will Paul suffer the same fate as Jesus? Will he be executed by the Romans as a political undesirable, or will he receive justice from Rome? Fourth, some scholars question the historicity of the shipwreck based on parallels with other ancient literature, including Homer’s Odyssey. Often a guilty man will try to escape justice (or fate), head out to the seas to avoid capture, but ultimately he will suffer and die anyway. Paul is escaping from the Jews, yet is shipwrecked and eventually nearly killed by a snake, it is thought that Luke is patterning this story after the archetypal Greco-Roman novel plot-line. There is something to the parallels and it may be Luke tells this story in such detail because shipwrecks were popular in literature at the time. But this does not necessarily negate the historicity of the story. Paul went to Rome, the best way to do that is by ship. It is entirely plausible Festus would send him off in this way. Shipwrecks were in fact common, so much so that Paul has already suffered shipwrecks twice in his travels (2 Cor 11:25)! While I think Paul did travel to Rome by ship and experienced a shipwreck, Luke’s theological motivation is that nothing will hinder the Gospel getting to Rome.